Sometimes our foreign fare gets Americanized. Pizza represents Italy. French fries represent France, but really, if you were to visit these countries, you’d find something different from what we see as “authentic.” Thai food is no different. Plenty of Americans are turning up at local Thai restaurants for Pad Thai and Masaman curry, but a little exploration off the beaten path might lead you to find some of the most exciting and authentic dishes that get overshadowed by the more popular fare. 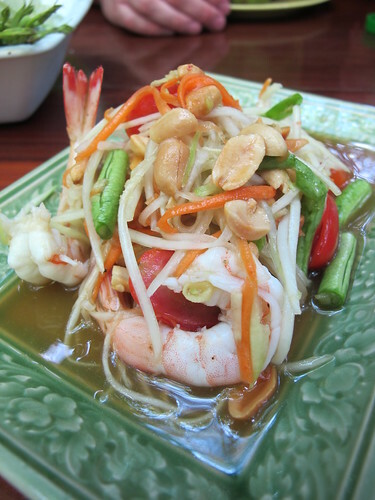 Thai salads are unique and adventurous and often combine unexpected vegetables and fruits. Try som tam, a green salad with papaya. When they’re in season, crab can be added for an extra texture and taste. Thai food is often associated with its aquatic life focusing on fish and fish oil, but they sure can incorporate pork and many of the best Thai dishes serve pork as the protein. Kao kha moo combines stewed (and moist!) pork wtih spices and Chinese brocoli along with a vinegar sauce. The kids might turn their noses at ‘pork collar,’ but as an adventurous adult, you’re ready to try out Khaw mu yang, grilled pork collar, which is one of the ubiquitous offerings by street vendors in Thailand. It is usually served with sticky rice and somtam. Pork becomes another adventure in Pad kra prow moo crop, a pork belly dish that mixes the crackle of fried skins with the delicate mixture of spices. This rich meat combines nicely with the light flavor for particularly enjoyable and unique Thai offering. If you’re more interested in chicken, try the Kao moon kai, with rice, stewed chicken, and a ginger-garlic sauce. It may sound simple, but that’s the key. The sauce contains chillies (depending on how hot you can take it) and altogether the spice and the heat along with the fall-off-the bone chicken make this dish a new experience you won’t want to miss. Pescatarians find no shortage of fish on the authentic Thai menu. Pla trout tod nam pal is marinated trout that is then flash-fried. This whole fish is beautiful in presentation. It can be served covered in mango sauce or with mango sauce on the side. You can’t go wrong with the textures and tastes in this dish. No one can say they’ve had a taste of a culture without ever experiencing that culture’s dessert. It might sound basic, but there’s no dessert better than a simple combination of some of nature’s best sweets — bananas and coconut. Leave it to the Thai to put nature’s simplest offerings in the best combinations. Next time you find yourself ordering your go-to Thai dishes, consider surprising yourself with these new dishes. You’ll find that the dynamic balance of tastes and textures you love so much in your regular choices are also in these lesser known dishes. Julia Rockwood is an avid traveler and freelance blogger for www.carinsurance.org.uk, a website that can help you find a cheap car insurance quote.